Christy Bird built its reputation on being the first port of call for locals who either wanted to sell what they no longer needed, or were looking to acquire antique or used furniture. These days, Christy Bird's goods are also sought after by customers who want 'real', solid items - and are keen to avoid the joys of self-assembly. 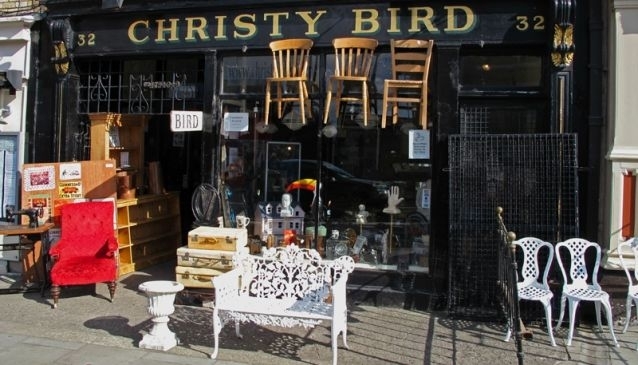 Serving Portobello - and beyond - for over six decades, Christy Bird is Dublin's oldest furniture shop. In May 1945, finding himself a widower with two small children to raise, pawnshop manager Christy Bird was determined to set himself up in business. He did exactly that in a location near Portobello Bridge, where Christy Bird & Co still trade to this day. Over the years, Christy Bird became a major recycler, taking in Dublin's cast-offs and giving them loving new homes. It didn't matter what sort of items they were - in the early days, second-hand jewellery was popular; later on, there was a brisk trade in used bicycles. Trends have come and gone, but if it had a resale value - Bird's sold it. The original Christy Bird died in 1975, but the shop has remained in the hands of the family with his daughter Annette at the helm for many years. The business shows no signs of flagging - grandson Christy Bird Flanagan now minds the store, and aims to carry on for some decades to come. Today, this quirky emporium is packed full of character - and stuff! As they say themselves, 'Variety Is Our Speciality', and that certainly is reflected in the sheer amount of antiques, garden furniture, new and used home furniture and used office furniture available. Not only do they buy and sell at Christy Bird, but they also make furniture to measure (for the home or shopfitting). Then there's the radiators, cast-iron fireplaces, collectibles, bric-a-brac, dolls' houses...and anything else they can possibly cram in. You might be drawn into the shop purely by curiosity (and the mad jumble of interesting articles in the window and on the pavement outside), but you're likely to leave with something really special.